Any numbers regarding the size? I guess it’s close to the bellator, so maybe 5km? Coming along nicely. Can’t wait to see the finished superstructure. Sithspit, those turrets, running lights & hull paneling…though I remain curious about those big cavities flanking the forward cityscape. VIP hangar space? Protected tender/maintenance area for corvette-scale friendlies? Nah, just unfilled-in greeble pits. Expect it took very much like the Executor cityscape-hull armor transition. There will be a big ventral cavity for hangar ops. And it will likely be very big indeed. If it’s shaped/placed/scaled anything like Executor’s, you’d definitely be hitting ‘able to haul its own frigate screen’ territory. Though that still wouldn’t quite hit the hangar-gape level of something like Anon/Concept Sketch #3, which I can only assume is some flavor of supercarrier. Yeah I haven’t finalized the shape yet. 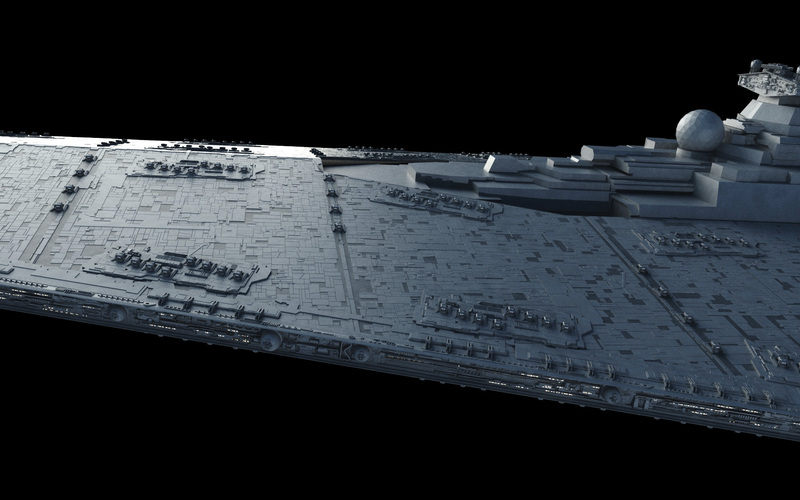 I think not full width hangar bay like the tower-less giant ship, which has to be a giant carrier. Probably will be split hangars like Assertor/Bellator, but much bigger triangular or trapezoidal plan apertures. Given that I plan for a relatively lower energy density, there probably won’t be a bulb either on ventral side. There might be enough ventral space for a *smaller* visible reactor-bulb portion, but big split-trapezoid hangars sound neat. Still wondering if Anons 2 & 3 would work as complementary top-end CEC products. That’s quite the sector-defense dreadnought there. All those DBY-827 batteries date this as a clone wars or before KDY design right? You know, when you realize that that thing carries the main battery armament of twenty-nine Venators (assuming I counted correctly), it really hits you what a monster it is. Probably a lot more than 30 Venators once you take into account those huge ball-mount trench guns and all the batteries on the ventral side, plus the MTL and maybe some ordnance tubes. I’d hazard a conservative guess of maybe a 70 Venator equivalent in terms of gunnery output, but with much fewer fighters, ground troops, and of course much less speed and range. Excellent guess! I’m targeting max single salvo throw-weight ~70-80 petatons. 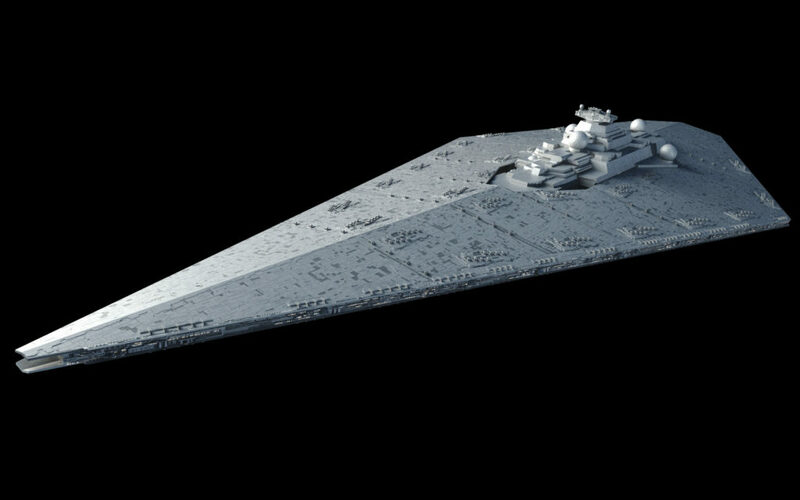 Similar to Bellator, but compared to that ship bigger to house a lot more fighters, troops, and EW and flagship equipment, and lower acceleration. Range is probably high though, given that it’s a line battleship, rather than a fast destroyer. There was some stuff in the old EU about intentionally limited range capital ships prior to the Clone Wars, which I found to be kind of hard to believe, but accepted anyways because I think it came from a Curtiss Saxton book. Regardless, the design is visually appealing as always. Any ideas on ion and missile tube armament for this latest murderwedge? This was due to restrictions placed on the military by the Ruusan Reformation. The Reformation effectively hamstrung the Republic military and focused on using jedi as peacekeepers. This is why the Republic needed to invest in a Clone army during the Clone Wars, since they didn’t have much in the way of a standing military. However, I am not sure why the Old Republic thought it was a good idea to dissolve their fighting force. Could someone please fill me in? Thanks for your input. At least I’m not the only one that thinks the Ruusan Reformation was a really bad idea. I’ll admit to a twinge of deep annoyance whenever SD.net discussion swings in this meta-narrative direction that paints fans registering their irritation with the Imperial-ineptitude-at-all-levels brainbug as borderline baby-eating fascist and/or dictatorship apologia (though the ‘Palpatine totes wasn’t that bad’ crowd need a clue, make no mistake). Competently threatening antagonists hardly undermine a given story’s message. Anyhow, agreed that had the Reformation *totally* defanged the Republic, Palpy wouldn’t have bothered subverting it with the unwitting aid of a Separatist threat. He could’ve just led said Separatists in open conquest (possibly after recruiting any Senate assets deemed worth the while). damn if this ship shot out 70-80 petatons I wonder how much the assertor can do. 1000 PETATONS!?!? THAT’S LIKE 1 QUINTILLION (1 Exaton) !!! The reactor is scaled to 400x ISD main reactor volume, so, yes, 1 exaton. A simple up-scaling of an ISD by 10x length would give you 1000x power, or 2.5 exaton. Wow just wow at this point is basically a one ship fleet. Wait if the Assertor power output is 1 exaton and is 400x more powerful than the ISD then that make’s the ISD (or Imperial II) power output to be 2.5 Petatons! Holy crap and I thought it would be in a teraton range. Sorry for the caps but the numbers like that is insane to think about. Anyway with that number that makes the Executor 500 Petatons since the Assertor was 2X more powerful than the Executor right? I think Executor is probably a little under-powered for its size, since it spends so much volume on hangars instead of reactor, but feel like anywhere from 250-500 petatons is a reasonable guess. so if that the case then it basically a super carrier while still be a dreadnought right? Also what is EW stand for anyway? Electronic Warfare. See also Electronic CounterMeasures (ECM), Electronic Support Measures (ESM), RadioElectronic Combat (REC). Huh and what do they do exactly individually? Alright i check out this electronic warfare on the Wikipedia (yeah it might be not reliable but i get what i want) and it was interesting and i bet this ship got the most EW out of all the ship right? Also since you said the Executor was around 1/4 – 1/2 of the Assertor’s power reactor would the Executor carry dual 720 HTLs as it primarily armament and quad 240 HTLs as it secondary like the Assertor or not? Would love to know your algorithm for doing all that panel work! Surely this can’t be done all by hand!? Can’t wait to see that beauty finished.